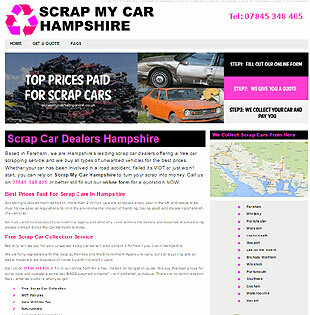 I design fully optimised inexpensive modern responsive websites for clients in and around Winchester - for sole traders, small and medium sized businesses and much larger business concerns. Clean, simple custom designs are my speciality - focusing your visitors on what's important; enquiries and sales. Mobile friendly websites for Winchester businesses are designed to perform consistently across all platforms so that your content can be accessed quickly and easily. Winchester and its rural surrounds is populated with a variety of businesses of all shapes and sizes and most will probably have a website. However, technology moves very fast and it's easy to get left behind at a time when most people find a business through a Google search - not from a printed directory. Get in touch today to find out how I can help your business make the most of the ever-changing Internet. If your site was built before the mobile revolution I can provide you with a new website that won't be as expensive as you might think. If you're unsure whether or not your website is mobile friendly - follow this link and see for yourself with Google's online moble-friendly test. Have a look at my website portfolio and see how I've already helped local businesses not just in the Winchester area but around the South of England. We are all very happy with the site. In fact when I sent it out to all the committee for approval I was expecting their usual fault finding. But surprise, surprise - they were pleased with the site. Just a short message to say how pleased we are with the website. Thank you for following everything up so quickly I really begin to feel that it's a vibrant, exciting site, and it looks as if we're getting somewhere. We appreciate all your efforts.